Resale Park Homes For Sale In Albir, Altea, Benidorm, Costa Blanca, Spain. SOLD SOLD SOLD!! Luxury Aitana Residential Mobile Home For Sale On Camping Almafra, Benidorm. Panoramic Mountain Views. Site Fee Paid Until 11/16. This refurbished Mobile Home has been designed to make maximum use of the over-sized spaces in each room. The home has 1 large Master Bedroom, 1 large central bathroom & 1 large open plan Living room/Diner & Kitchen. This is a high quality Aitana Mobile Home which comes with standard features such as tiled floors throughout, double glazed windows with insect nets & shutters, underfloor insulation & permanent residential fixtures & fittings throughout. The Bedroom has a double bed, fitted wardrobes, bedside cabinets, dresser table & air-conditioning unit. The Bathroom is equipped with large corner bath/shower, toilet, sink with vanity & Bidet. In the open plan Living area is a double sofa bed, wall mounted flat screen TV & Dining table with 4 chairs. The Kitchen has fully fitted appliances- gas hob, built in oven, fridge freezer & gas combi-boiler. To the front is a decked area with wheelchair access, car parking space for 1 car, and a small garden. 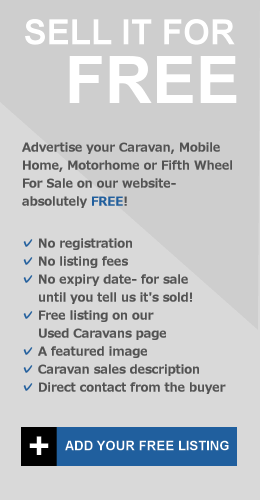 Interested In This Mobile Home? Contact The Seller Directly By Filling Out The Contact Form Below.. 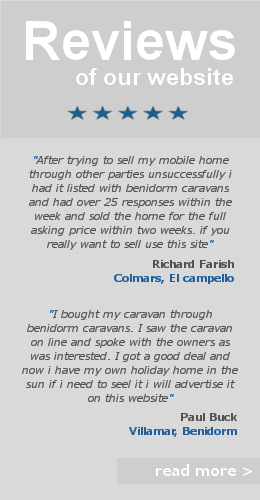 Camping Almafra Residential Mobile Home Sales, Benidorm Mobile Home Parks, Costa Blanca Caravan Sales. ← REDUCED PRICE BARGAIN! HOBBY CARAVAN & AWNING FOR SALE IN BENIDORM.